View More In Water Heater Parts. - Brass body with chrome plated, solid and durable. - Temperature Range: 35 to 60 degree. - No matter how the temperature and water pressure change, it will stabilize the water flow. 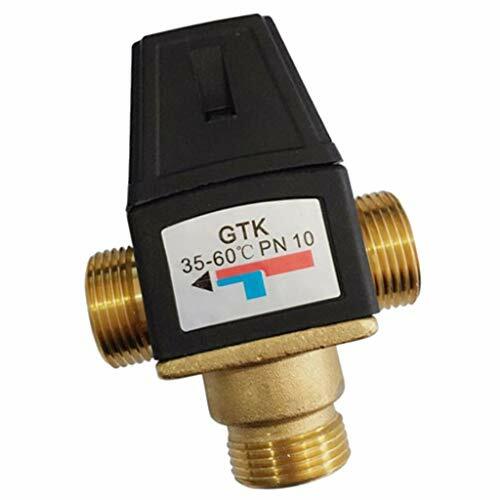 - Built-in temperature control component, in the event of a cold water failure, the safety device automatically shuts off the supply of hot water to prevent burns. - The thermostatic mixing valve has a high flow rate and good universalperformance, suit for domestic hot water, small floor heating circuitswith HWC (hot water circulation). Brass body with chrome plated, solid and durable. Temperature Range: 35 to 60 degree. No matter how the temperature and water pressure change, it will stabilize the water flow. Built-in temperature control component, in the event of a cold water failure, the safety device automatically shuts off the supply of hot water to prevent burns. The thermostatic mixing valve has a high flow rate and good universal performance, suit for domestic hot water, small floor heating circuits with HWC (hot water circulation).